Chacaltaya is a mountain near La Paz at an elevation of 5,300m (~17,400 ft) where there used to be a ski slope. It was the world’s highest lift-served ski slope and Bolivia’s only ski slope (Bolivia actually used to have an Olympic ski team). However, climate change has reduced the amount of snow, and skiing is no longer possible. More than 80% of the glacier that used to be there is gone. We climbed from the old ski lodge to the peak in about 20-30 minutes, so it wouldn’t have been a very big hill, but there is no way you would be able to ski there now. Click here to see a BBC article with a diagram of how the glacier has melted in recent years. After about two hours of driving (we were held up slightly by traffic in El Alto due to a parade – Monday is a holiday in the Department of La Paz, although some of us don’t get it off!) we arrived at the old ski lodge. The tour operator tried to tell us it wouldn’t be cold. He lied. Luckily, we were smart enough to know that at 5,300m it is cold and went prepared. We started the trek at the base of the ski slope and walked up to the summit. Under normal conditions, it wouldn’t have taken very long. But, at 5,300 m there is really very little oxygen to be had so you have to take the uphills pretty slowly. Every 10 steps you are out of breath again. 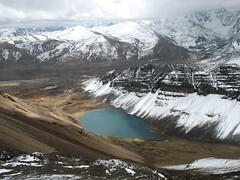 (It is not recommended to go to that altitude without having spent 10 days at the altitude of La Paz – 3,500m – first). We reached the summit and were able to hide from the wind behind a concrete structure that was used for the lift while we took some photos of the magnificent views. Then we hiked downhill a short distance before starting up to the second summit. The wind was so strong there that it felt like it could blow you off the mountain. Luckily, it didn’t. From there it was mostly downhill, but the terrain consisted of small and very loose rocks, so it was good that the tour company provided us with a ski pole. We stopped for a quick lunch of warm chicken and rice (so good! Don’t know how the guide kept it warm) and then continued on. We walked by a beautiful lake and saw some llamas. At the end of the walk we passed by an old mine and the abandoned buildings of the mine and its community. We arrived back in the oxygen-rich (ha! ha!) city of La Paz at about 4:30, slightly wind-burned and tired. All in all it was a very good day. I was at the highest altitude I’ve ever been, without being in a plane. Enjoy the pics! Submitted by Melissa (not verified) on Mon, 2007-07-16 23:00.